Remember this after Brown’s first few weeks? Does the Guardian make a habit of this? Thanks to ChristinaD on the previous thread for reminding us that the Guardian has form for eulogising over a Prime Minister a few weeks after entering Number 10. Today’s Martin Kettle column on David Cameron follows in the tradition set by the above piece from August 2007 shortly after Gordon Brown became Prime Minister. “Has any Prime Minister had a more difficult first month?” the headline read inviting the obvious response – “Yes – Churchill in May 1940″. Whatever trials and tribulations Mr. Brown had to deal with three years ago they were nothing on the scale of the fall of France and the Dunkirk evacuation. It didn’t take too long for the Guardian to become a Brown-sceptic and my guess is that the same will apply to Cameron. In a world where politicians continually try and rebrand themselves and define their image in the public’s mind, and pay agencies a lot of money to attempt it on their behalf, last week we saw one of the most successful rebrandings for years. It is commonly presumed that the public saw Alistair Darling as a bit dull, inoffensive, but useful, like magnolia paint or carrier bags. Well, that was on Monday. By Wednesday his â€œforces of hellâ€ quote had changed all that. At the conclusion of a lengthy piece on PM (about 32 minutes in) Simon Hoggart concluded that Darling as Labour leader â€œmight be worth a flutterâ€. 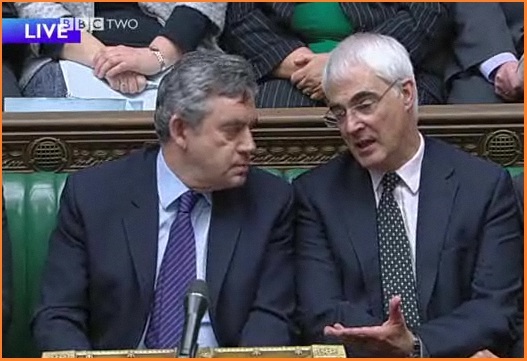 “Might Mr Darling be positioning himself to take over from Gordon Brown in the event of an election defeat? Not as a long term Labour leader, but in a caretaker role while the party sorts itself out, and waits for a young, strong, long-term prospect to emerge. Mr Darling’s reputation has certainly been enhanced during his three years as chancellor, and now, with just three words, he’s managed to distance himself very effectively from the more unpleasant aspects of the Brown regime. Unlikely? Yes. But I can tell you that the idea of Mr Darling as caretaker is certainly being contemplated by some of his friends. Whether caretaker status or not (and that would depend on the outcome of the election) Darlingâ€™s ability, as Simon Hoggart says in the Radio 4 piece â€œto keep the temperature downâ€ would be highly useful after a defeat or in a hung parliament. In addition, with one statement Darling has managed to distance himself both from the unpleasant aspects of Brown’s tenure at Number 10, and the culture of spinning assumed (wrongly) to have begun under Blair’s regime. In the case of a heavy defeat then I doubt Labour would want replicate the mistaken, hasty, elevation of a Hague figure, while in the case of a hung parliament, a consensual, experienced figure such as Darling seems to me to fit the bill. For added piquancy, it is not beyond the bounds of imagination that Darling believes briefings against him may have been linked to a potential rival in any leadership race. He said to the BBC that he stood by his â€œforces of hellâ€ quote â€“ â€œOf course I do, all of it, not just part of it, all of itâ€. Thatâ€™s fighting talk in anyones language. So on the betting front, before this week Iâ€™d rated Darling as an 8/1 shot for the leadership, after this week Iâ€™d make that 6/1. As the narrowing poll lead and Scottish polling in particular show the chances of him losing his seat in Edinburgh SW receding, I think that the 25/1 available is very attractive. Does Labour always win the final week? Did Brown’s party recover 30+ seats? In its post mortem of the 1992 election Labour identified a key weakness which it sought to address in all the following four elections – the critical importance of the final week. For its only then that many voters start to focus on what they’ll do and when a focused get out the vote message can be most effective. For the 1997 election the party created a special final week team. Whether they did the same this time I don’t know but like in 1997, 2001 and 2005 their final effort seemed to be highly effective. For 2010 they put the emphasis on the Tory threat to child credits and used the above Ross Kemp video as both a PEB and a DVD that was distributed to 0.25m key households. 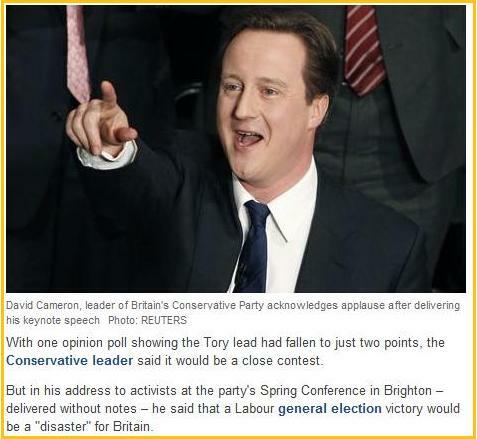 If there were final week themes from the Tories and Lib Dems it was hard to identify them. Maybe this saved Labour from total disaster? Why did the Sunday Times switch the numbers? How did the lead drop from 6% to 2% between editions? The massive confusion over what the poll numbers actually were that we saw on the thread overnight is now becoming clear. 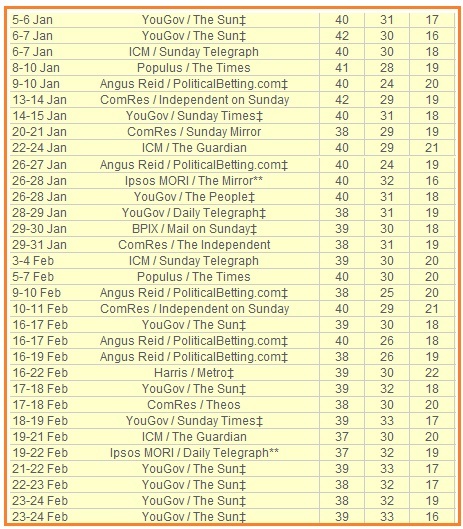 For after the NOTW reported the 2% gap there were several posts saying the Sunday Times had it at 6%. But the Sunday Times poll findings changed between editions as those who have been watching BBC1 have been told. In the earlier ones it was at 6% – the later ones had it at 2%. Why? All this does is provide material for the conspiracy theorists especially as the fieldwork ended on Friday and the finalised figures must have been around for most of Saturday. I don’t know how YouGov work but I assume that it’s like Angus Reid. When the final figures are ratified by the pollster they are then sent to the client. Period. End of story. I have emailed Peter Kellner.